Okay, you don’t have to look very far to get the vibe of the Grizzly brand. This line of coolers is especially famous for their series of hard coolers, which have proven themselves to be hardy, versatile, and absolutely beastly when it comes to doing the job that they were meant to (check here). Like the grizzly bear, they have shown themselves to be the ultimate survivor and a perfect companion to the hunter or any other adventurer looking to brave the great outdoors. 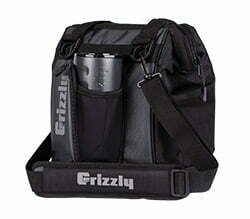 But now they want to take the market by storm with their soft coolers, showing grizzly bears can have a soft side too. Will their line of soft coolers called Drifter live up to the hype built up by the hard coolers? Well, let’s find out! 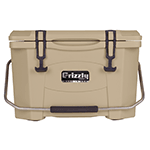 When it comes to build quality, the Grizzly soft-sided cooler offers good value for money. It comes with two capacities; the 12-quart cooler and the 20-quart cooler. Both are built to withstand the harshest conditions and still hold their head up. The shell is pretty sturdy and waterproof, ensuring it’s easily going to withstand the wettest of conditions. 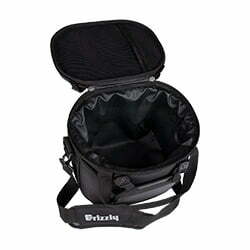 The bag itself has a very sleek appearance, coming in gunmetal black through and through. The only way anyone will be able to know you’re carrying a soft-sided cooler is if they take a long and hard look at the backpack. Otherwise, it could be seen as another petite rucksack that’s worn for aesthetic purposes, rather than functional ones. Isn’t that great; something that looks stylish but also does its job well? 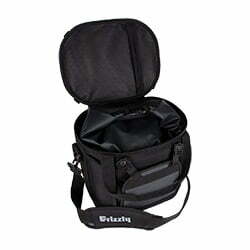 It also feels very strong and sturdy in your hands, meaning you don’t have to worry about the durability of this bag. It also fits very comfortably on the back so you don’t have to feel like you’ve got a very heavy load, no matter how much you’re packing in the there. One other thing that we found beautiful about it is that you don’t have to use it for the grizzly outdoors. 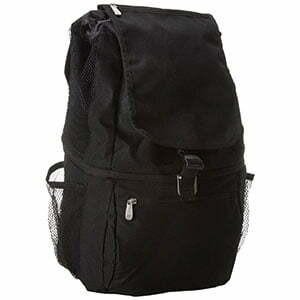 This back is perfect for carrying your lunch to school or work as well and will do the job just as perfectly! There are plenty of things on this bag that were obviously built to go beyond the just functional to the aesthetic as well. The very first noteworthy feature is the shell. It’s made of polyester, which means it’s not going to react with any of the contents and is going to last a very long time. It also happens to be ballistic and waterproof ripstop. 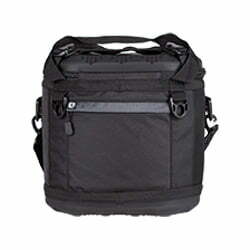 The ballistic aspect means that this bag can literally take a pounding! Drop it over the side of your house, from a moving car onto the road, over the side of the cliff… You can drop it pretty much anywhere from a fairly great height and it will survive the fall and the impact at the end. They say it’s not falling that breaks things, it’s the sudden stop at the end. Okay, that’s really just us; we said that. But it’s still true! The heavy-duty zippers are as strong as it gets, They are waterproof, which is a must, and they’re also very easy to open. Of course, we’ve complained countless times about zippers that were so strong and heavy duty that we couldn’t open them until we’d had a good meal and a week of weight training. We get the idea of a good zipper, but there should be a way to make it tough on the elements but not on the user trying to get into the bag. 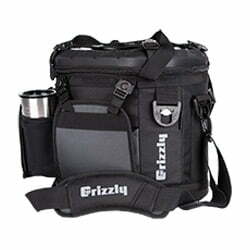 The grizzly soft cooler was designed to cater for that and we are appreciative of the kind people behind the design. Have we talked about the TPU on top? 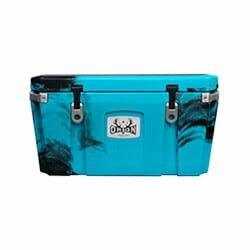 This is what keeps the food and drinks cold when you’re carrying them around inside your soft cooler. That’s because it provides insulation. 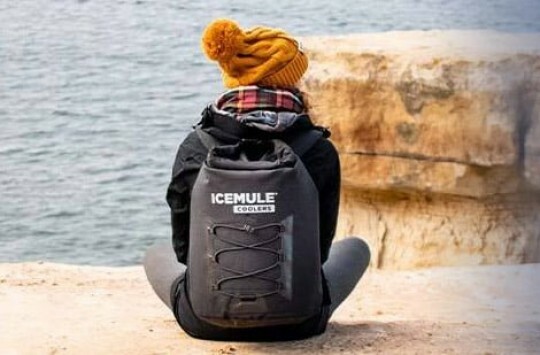 But sometimes, when you want to clean the liner because of something like a spill, or you just want to use the cooler like a regular backpack (because it’s that awesome) and not just like a cooler, you might want to take it out. Well, it’s very easy to do that because the TPU liner is a roll top removable type that you can easily detach from the main back whenever you want to. 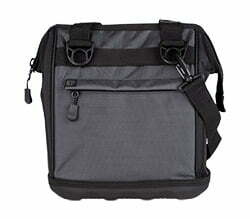 It’s also just as waterproof as the rest of the bag because it happens to come with a drop locker and is 100% waterproof. 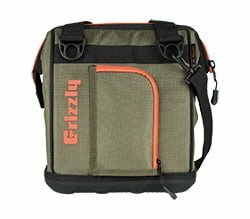 The ice retention on the Grizzly soft cooler isn’t one of its strong suits. When you compare it to other players in the market like the Yeti Hopper, or even RTIC SoftPack and other competitors, you figure that it isn’t the longest ice retention you’ll find. All the same, it will do just fine and will last you about 2 or 3 days, assuming you don’t keep opening the soft cooler every 5 minutes. 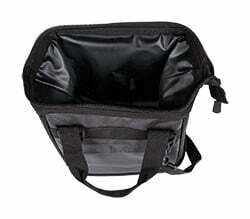 But then again, this is a soft cooler for carrying your lunch on one-day trips. It really isn’t meant to retain ice for very long periods. If you want something a little longer lasting, you might want to look into hard coolers. 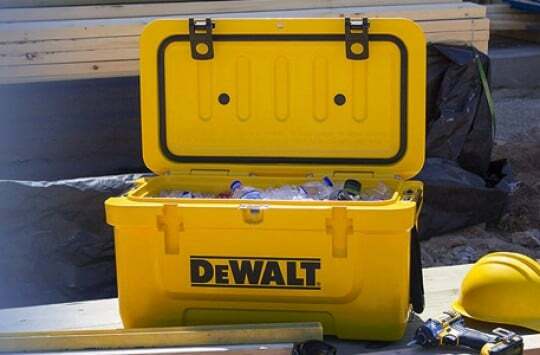 This cooler comes in two sizes: The 12-quart soft cooler and the 20-quart soft sided cooler. Perhaps this is an area where Grizzly could a little better by offering more. For the color, the 20-quart Drifter has two options: black/gunmetal and green/black/orange. The 12-quart Drifter, besides those two already mentioned, has one more choose possible: teal/black. We think they could also do a little better by offering a few more color options. Of course, somewhere in our reviews, we have to pit the incumbent against the industry giant: Yeti. There are a lot of comparison points where Yeti clearly wins, but let’s take them one at a time, shall we? When it comes to variety, Yeti clearly wins out. 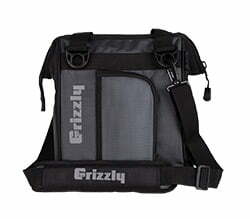 The Grizzly Drifter only offers two available sizes and three available colors. Meanwhile, Yeti has multiple options for each. The closest comparison to the larger Grizzly, the 20-quart Drifter, is the Yeti Hopper Flip 18. If you’re looking for variety, then you might want to consider getting yourself a Yeti. As far as ice retention is concerned, the Yeti Hopper blows the Grizzly Drifter well out of the water. 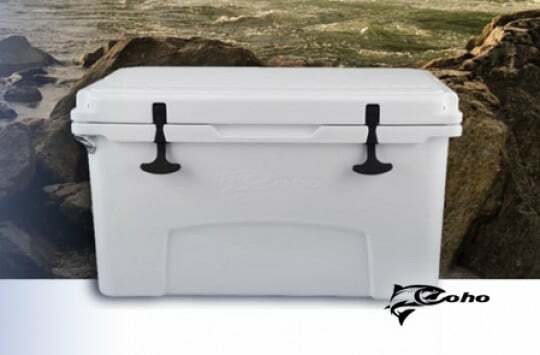 With a Grizzly Drifter soft-sided cooler, you get 3 days at most and you have to make sure you don’t open the cooler too frequently. On the other hands, while Yeti don’t officially announce their ice retention on their site, you could easily get 5 or 6 days out of the Yeti Hopper Flip 18. 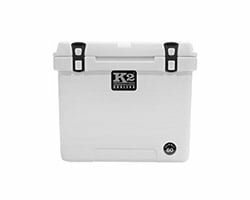 The build quality on the Yeti is also much better, with Yeti Hoppers and Yeti coolers, in general, lasting a very long time. They’re not the industry giants for nothing. 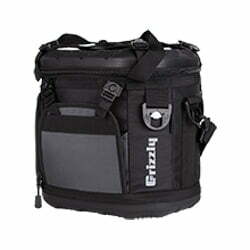 However, the build quality on the Grizzly Drifter soft cooler is also pretty good. 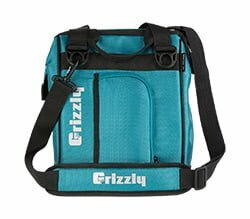 As far as features are concerned, the Grizzly offers some pretty cool features, some of them the same as what you get with the Yeti Hopper, without having to pay the premium. 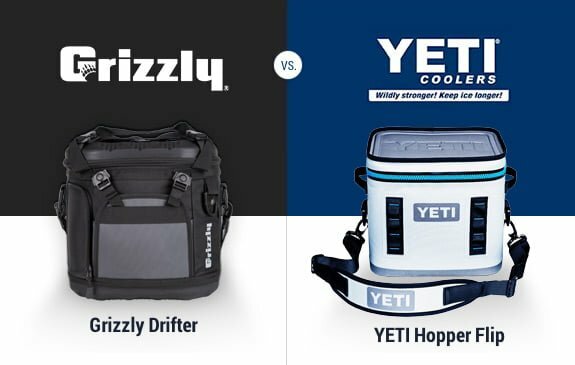 The major winning point for the Grizzly Drifter soft sided cooler is the price, where you get something much more affordable than a Yeti but with many of the same features. If you’re on a budget but still want quality, then this is the cooler for you. Bother are top brands and both offer quality coolers. On the one hand, we have the Yeti Hopper, which is well known as a leader in the industry. However, that doesn’t mean you’ll be disappointed with the Grizzly Drifter. It has some pretty cool features at a lower price. We have a hard time choosing, to be honest, so we’d advise you to compare the features to the price and take the brand that offers you the most bang for your buck. There are two major competitors here: The RTIC SoftPack and the Engel HD30. 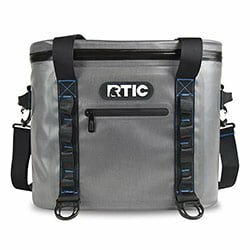 The RTIC SoftPack is great for fishing, boating, and tailgating. 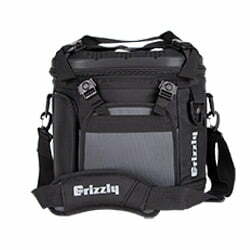 It can take about 20 cans and has many of the same features as the Grizzly Drifter, including the water-resistant shell and a ballistic and waterproof liner. It has an advantage in that the liner is especially made to resist mildew and other microbes, but then it doesn’t look as classy as the Grizzly Drifter. Read our RTIC SoftPack review here or get it on Amazon now. The Engel HD30 offers a major advantage over the Grizzly Drifter and that is that there are a lot of color options, with some pretty cool colors in the line-up. 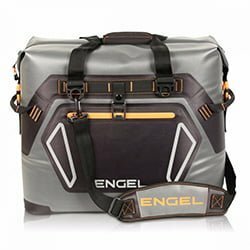 If you really want to make a statement with your soft cooler, then the Engel HD30 is the cooler to go for. However, in terms of build and general design sans the color options, the Grizzly Drifter is still superior. Check our Engel HD30 review or get it on Amazon. You have plenty of options here. You could do it on the Grizzly site itself, or on online shops like Target and Walmart. However, we advise you to do it on Amazon. You’re going to get lots of advantages if you choose Amazon for your shopping. You get free returns if you don’t like the product, great discounts if you’re a Prime member and same day shipping on some products. You also get to see lots of reviews by similar customers who’ve already bought and tried your favorite products. So that’s how soft the grizzly can get. 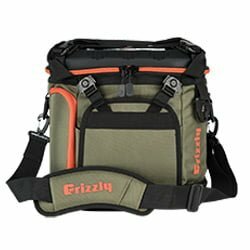 As you can see, Grizzly Coolers did not disappoint with this latest addition to their lineup and you are likely to enjoy your time with one of these beauties. If you’re a certified grizzly and need to get soft for a bit, then go grab one for yourself!